Discover Life provides information on the taxonomy, natural history, distribution, abundance, and ecology of the world's flora and fauna. Site materials include a database of all known plants and animals, featuring photos, maps, identification guides, and facts about each organism, arranged by group: amphibians, reptiles, mammals, plants, insects, and others. The site's "Tree of Life" is a diagram (phylogenetic tree) that graphically displays the relationships between major groups of living organisms. Its IDnature guides are interactive identification resources that let users select and search on physical attributes of an organism to obtain potential matches with known species. There is also a global mapping tool that lets users generate distribution maps of individual or multiple species. The education page provides images, maps, lesson plans, and other resources for teachers and students. 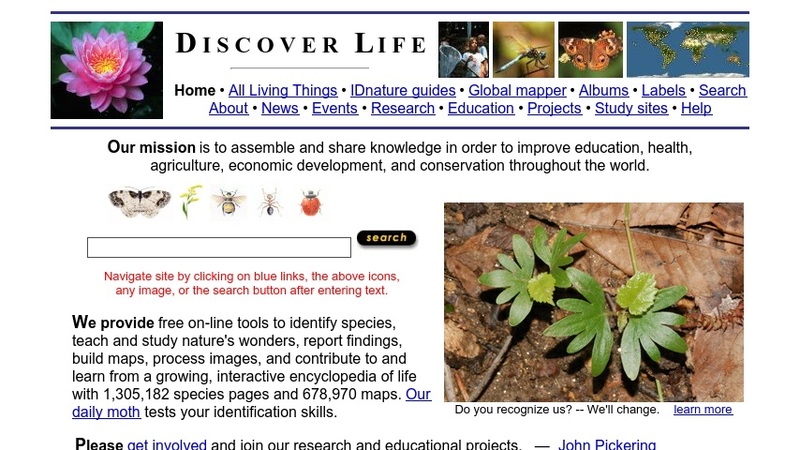 Other materials include information on invasive species, information on specimen labels, a search tool for locating organisms, information on the Discover Life project, and links to related web sites.